Although the gold was nowhere close to Victoria, the city was the defacto supply center for the 1858 gold rush on the Fraser River. Thousands of gold miners headed north from San Francisco towards new gold strike claims along the Fraser River, including many Chinese. Soon Victoria grew to become both British Columbia’s biggest city and the home base to Canada’s largest Chinese community. When Chinatown was founded, in 1858, it was the first in Canada and second in North America, behind the former gold-rush community in San Francisco. Today, it remains a vibrant part of Victoria’s downtown area, even if the local Chinese-Canadian population is considered small compared to many other cities. 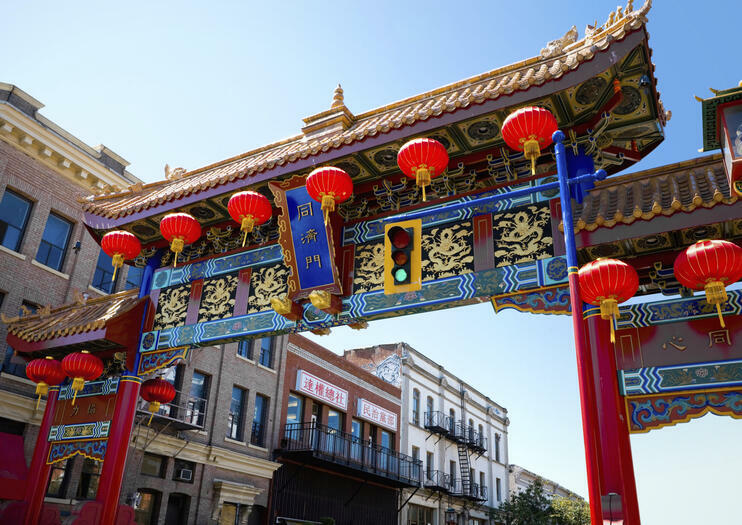 The impressive Gate of Harmonious Interest marks the entrance to Chinatown and the community reveals itself along Fisgard St. The recently reopened Dragon Alley, the Chinese Public School and all the many colorful shops will all draw considerable attention, but self-guided visitors shouldn’t miss the opportunity to walk through Fan Tan Alley, which is undoubtedly the most famous part of Victoria’s Chinatown, if not the city itself. The main entrance to Victoria’s Chinatown is located at the corner of Government and Fisgard Streets. Explore the city of Victoria and the famous Butchart Gardens on this half-day guided tour. On the way to the gardens, stop at several attractions including Beacon Hill Park, Craigdarroch Castle, and Mount Tolmie Park. While at the Butchart Gardens, take in the impressive floral displays and the many theme gardens. On the return trip, visit Chinatown, Parliament, and the Empress Hotel. See the sights of Victoria at your own pace. This package allows you to board and re-board the tour bus at your leisure as many times throughout the day as you like as it follows its route through the city. Redeem your voucher at the main departure point in the Inner Harbour. Stops include Chinatown, Christchurch Cathedral, Beacon Hill Park, Oak Bay Village, and Craigdarroch Castle, plus many more. Explore British Colombia’s Victoria by pedicab with a guide on this 2.5-hour tour of the city, including convenient pickup and drop-off at the cruise ship terminal. Travel through one of Victoria’s oldest neighborhood, James Bay, to one of its oldest grocers. Then pass through Beacon Hill Park, and see the peacocks there. Plus, catch a glimpse of the famous Empress Hotel. The Canadian city of Victoria has a rich British colonial history dating back to the Victorian era, evident in its striking architecture and historic landmarks. Explore the city in style by traditional horse-drawn carriage, and take in sites of interest such as James Bay— one of Vancouver Island's oldest neighborhoods—and the Salish Sea waterfront. As your horse clops along, enjoy fine views over Victoria to the Olympic Mountain range beyond. Take the adventure route between Vancouver and Victoria with a scenic 35-minute flight. Soak up lovely aerial views while crossing the Strait of Georgia by seaplane — the most eco-friendly transport to Victoria — then set off on your own sightseeing excursion of BC’s capital. At the end of your day, catch the ferry back to the mainland, admiring stunning island and ocean views at dusk. Make the most of your trip from Vancouver, BC, to Seattle with a full-day tour that includes a visit Butchart Gardens and free time to explore historic downtown Victoria. This point-to-point tour concludes on the Seattle waterfront, and includes hotel pickup, ground transport, ferry tickets, and entrance fees. Explore the beautifully historic center of Victoria, then trade downtown streets for the flower-lined paths of Butchart Gardens on a half-day, private tour of the city. You'll start with a trip to Fisherman's Wharf, then see the Parliament Buildings, the Empress Hotel, Beacon Hill Park, and Craigdarroch Castle, following scenic roads through the Vancouver Island countryside. With departures throughout the day, this tour of Victoria highlights is priced per vehicle, and can be tailored to your private group of up to seven people. If you are short on time, but eager to see the most beautiful spots in Victoria, this is the tour for you. Have your camera ready for stops at Fisherman’s Wharf, Chinatown, Beacon Hill Park, Craigdarroch Castle, the Lieutenant Governor’s estate, and Oak Bay Village and Marina. Get your small group together and enjoy this guided tour through all the gorgeous scenery of Victoria. Capital of British Columbia, Victoria sits on Vancouver Island—with beautiful Victorian architecture and sweeping coastal views. Ideal for visitors short on time, this flexible sightseeing tour starts any time between 8am and 8pm, and takes in top attractions such as Beacon Hill Park, Chinatown, and 19th-century Craigdarroch Castle. Stop throughout your tour to capture the city on camera, with round-trip travel from your Victoria hotel included. We strive to offer the best tour possible so we keep the tour groups smaller in size (8 max). This allows for a much more personalized experience for each of our guests.